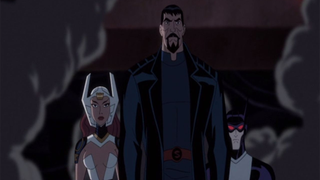 We've known for a while that the legendary Bruce Timm was returning to the DC Animated Universe with Justice League: Gods And Monsters, but although we knew it was a going to be "darker take", I don't think anyone was expecting these radical redesigns of DC's heroic Trinity. Nerds on the Rocks recently posted a series of images from Gods And Monsters, apparently from a preview for the film included with the upcoming Batman Vs. Robin animated movie. The preview pictures showcase major redesigns for this "Elseworlds" take on Wonder Woman, Superman and Batman, but also come with descriptions of the darker origin stories that have shaped the characters into a much more violent version of the Justice League. According to Nerds on the Rocks, this version of the Justice League features a Superman who is the son of Zod rather than Jor-El, and instead of being raised by the benevolent Kents, was discovered and brought up by a family of migrant farmers — the tough upbringing as well as his father's villainous legacy creating a Superman who's much more willing to get violent. The information given about Wonder Woman is much more slight, only adding that this version of Diana is the wife of the New God Orion (one of Darkseid's sons in the comics). However, the information about the new Batman is certainly the weirdest of the trio: He's a vampire. This version of Batman is not Bruce Wayne, but Kirk Langstrom — better known in the DC Universe as Man-Bat — who becomes vampiric after attempting to cure his own cancer with Bat-Venom. I guess if you have to feast of people's blood, it might as well be the blood of a criminal, right? They definitely weren't kidding about this being dark! Although Justice League: Gods and Monsters does not yet have a release date, a preview of the film is included in Batman Vs. Robin, which is due for release on April 14th.